The Epson ColorWorks C7500 Gloss (TM-C7500G) color label printer is designed specifically for use with high gloss media for the production of "prime" product labels. Retailing for $8,499 USD (choose our low monthly lease payment), this full color product label printer is an affordable alternative to using commercial printing services. 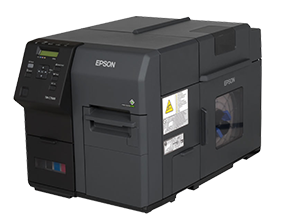 Pair the Epson TM-C7500G with the optional TM-C7500 Rewinder to print roll to roll for just $749 more. Want to print industrial matte or ghs chemical labels? A matte version, ColorWorks C7500 Matte, is also available. View the similarities and differences here. DuraFast Label Company is your one-stop source for Epson TM-C7500G Glossy ink and supplies. Check out the Epson TM-C7500 Glossy in the video below. 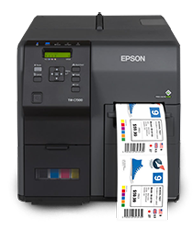 Compare Epson TM-C7500 & TM-C7500G Label Printers? *7 days after your printer is shipped to you, you will get an email from Verified Reviews to do a review on DuraFast Label Company and also this Printer. Once both reviews are done, we will credit your online account $500 towards label purchase.